I love chocolate and fruit combinations, and chocolate-cherry is underutilized if you ask me. Here we have a low-fat and moist tube cake with hints of cherry that you could probably amplify by garnishing with fresh cherries. This recipe is adapted from the chocolate cupcake recipe in Bryanna Clark Grogan's The (Almost) No Fat Cookbook -- which means that you could probably adapt this back to cupcake format for chocolate okara cupcakes, if you're one of those people. Cooking time would probably have to be reduced to 20-25 minutes for cupcakes, but I haven't tested that out personally. and stir until ingredients are incorporated. 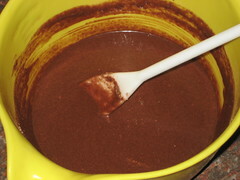 Place the flour mixture into the wet ingredients and stir until just combined. Scrape all of the batter into a lightly oiled 8-inch tube pan and spread evenly. Bake at 325 degrees Fahrenheit for 45 minutes. Cool on a rack. 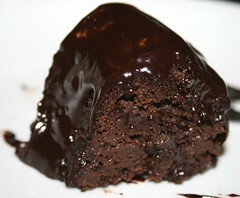 Warning: When I cook this, the batter usually overflows the pan a bit during baking. Put something underneath the pan that will protect your oven, but try not to impede air flow especially if using a convection setting. Above: A very ugly cake! Don't worry, it looks nicer when it's removed from the pan. 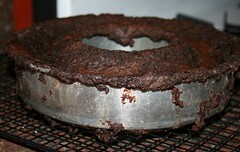 Remove cake from pan, turning it onto a flat surface (like the bottom of a cake holder). I had to cut away parts of the cake that had flowed over the edge of the pan, and then I carefully ran a knife around the edges. After doing that, it fell from the pan pretty easily. 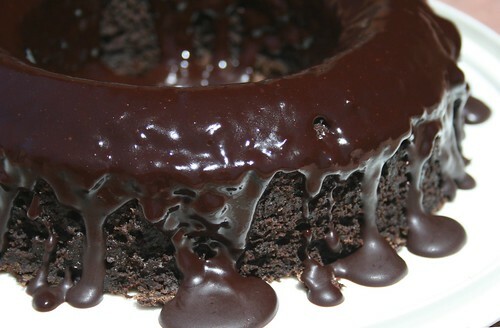 At this point, let the cake cool while you make a ganache frosting. and stir until lumps have disappeared and the mixture is smooth and shiny. 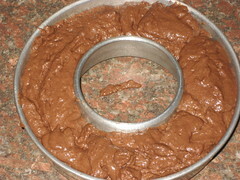 Pour over the cake very carefully, allowing it to drip down the sides. You'll probably have more than enough frosting -- use the leftovers to dip fruit in! Yum. 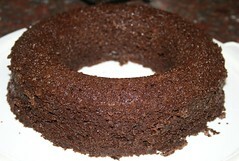 Allow the frosting to cool (in the fridge if desired), then cut into pieces and enjoy. Thanks! I think cherry juice is my new secret weapon for ganache frostings. The cherry really highlights chocolate's natural fruitiness. People say that coffee amplifies chocolate's flavors, but I think cherry juice also has that potential. Thanks so much for your comment! I'm glad it worked out so well, and thank you for noting the baking time. I'll have to try it myself sometime!